Warm and festive, this spiced cranberry and apple juice wintertime beverage will scent the air with traditional holiday aromas. Combine all ingredients, except garnishes, in a large saucepan. Heat to boiling, reduce heat and simmer 10 minutes. Strain punch to remove spices. 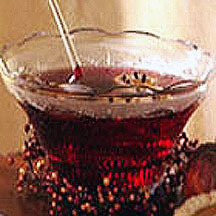 Place in a heat proof punch bowl.Garnish with orange slices studded with cloves, if desired.